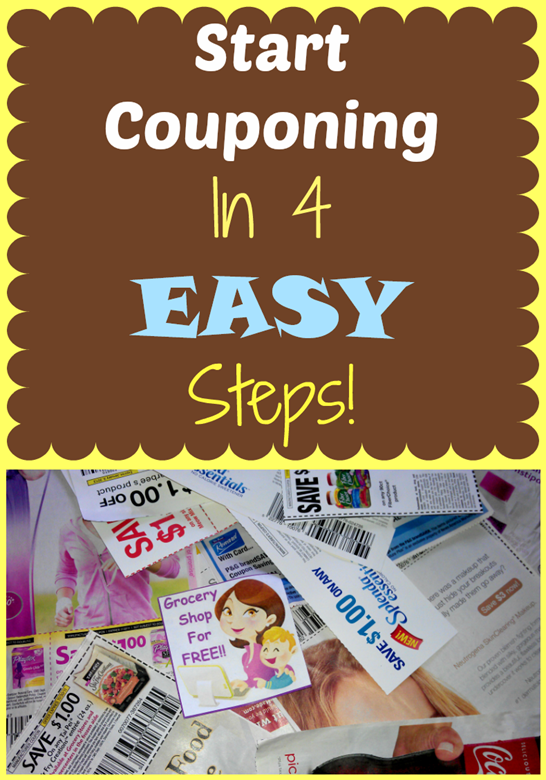 Start Couponing In 4 Easy Steps! You are here: Home / Finance / Couponing / Start Couponing In 4 Easy Steps! I want to share with you how you could Start Couponing In 4 Easy Steps! Several times a week someone will tell me they really want to coupon but don’t know how to get started. Well, I definitely know that feeling I went years wanting to learn but never figuring it out on my own. So, let’s get started! The coupons come mostly in the Sunday paper. There are anywhere from 1-6 booklets of flyers or inserts in the Sunday papers. Usually there’s always a Smart Source and a Red Plum, and sometimes there are more than one Smart Source or Red Plum, and then sometimes a General Mills, or a Proctor & Gamble. The store sales ads are usually (in our area) in the mail on Tuesday or Wednesday, or they might be in the paper. In our area the stores sell the early Sunday edition of the newspaper on Saturday in a two pack. So, we can buy 2 newspapers and get two sets of coupons at a time. also our Dollar Tree stores sell them for just $1. You can also ask your neighbors, friends, and family to keep coupons from the Sunday paper for you, too. Many times I have been in a restaurant and noticed that someone had left the paper behind and I just grab the coupons out of it. Once you have the coupons what now? I usually get 10 newspapers each week. No, you don’t need that many, but, when I first started my friends and I found a way to get them FREE, so why not? There was a group of local restaurants that got the Sunday paper to give out to their customers and they kindly gave us the leftovers! So, check around, ask around and see what you can find, there might be a way for you to get some extra papers, too. A. You can take your coupon flyers and write the date on the front and put them in a file or basket, and then when you need a certain coupon you can find it easier. B. If you have acquired more than one paper, then you have more than 1 set of flyers. So, you can take a particular flyer, (say you have acquired 2 papers and have 2 sets of flyers) get two of the same flyer and put the identical pages from each flyer together. So, if your flyers were 10 pages, and you had 2 identical flyers, you should have 10 stacks of 2 identical pages together. Now, paper clip each set of coupons together. So, if you have 3 coupons on the front of one stack and 2 on the other side of one stack, you would need 5 paper clips, paper clip the identical coupons together. Try to put your paperclips over the UPC Code so that you don’t accidentally cut the code off. Now, you can do this two ways. You can file them as they are now and when you need some of them you can pull them out and cut them, or you can cut them all now. If you choose to cut them later, just put them together and file them by name of the flyer and by date (i.e. Smart Source 2/13/11). Again, so that you can find them when you need them. If you want to cut them you need a place to put them where they are easy to find when you need them. You can buy a large notebook and buy either baseball card holders or photo pages to put them in. Either way it’s up to you and what makes it easier for you. I tried the photo pages and then changed to the baseball card pages, now I use a combo of baseball card pages and files. If you choose to cut them all and put them in a notebook, you can take your notebook with you to the store every time and then when you see an unadvertised sale you will have all of your coupons and you can use them for the sale! C. Now, personally, I paperclip and file mine in a filing cabinet with the date and name of the flyer on the tab of the file folder. I put any coupons that I cut to use at the store and then didn’t use in my notebook. Ok, if your store doubles or triples coupons, you are in a great place to start! So let’s look at what that means: If I have a $0.25 off coupon for butter and butter is $1 and my store triples coupons up to $0.39, then my coupon is good for $0.75, not just $0.25! So, that makes my butter $0.25, now when was the last time you bought butter for a quarter?! So, even better, what if you have 2 coupons for butter or 4? You would have enough butter until the next time it goes on sale! So, let’s look at doubling: if your store doubles up to $0.50, then your $0.25 butter coupon would be good for $0.50, not $0.25, so then your butter would be: $0.50! Still pretty good! Now, you need to know the rules at your store, because there are rules. First of all, print all of your stores coupon policies and carry them with you. Some stores will only double or triple one like coupon (1 butter coupon, not 2) per order and then treat all other like coupons at face value. In these cases the district manager has told us that as long as we aren’t holding up a line we can check-out more than once. Now my being able to get butter for a $0.25 makes me not mind standing in line and checking out a few times. Try to go when the store isn’t really busy. But, we haven’t talked about FREE! That’s right there is always FREE! I love FREE! If there is a 10 for $10. sale on butter at my store, I know that means I can buy 10 butters for $10., but, does it mean I HAVE to buy 10 butters in order to get the sale price? NO! Absolutely not! You can buy 1 or 3 or however many you want and they will all ring up for the $1 price. It’s kind of simple when you think about it, but, I didn’t pay much attention, I always thought, “I don’t need ten of those!” Never thinking I didn’t have to buy ten! So, now I am buying hand soap and I have a $0.35 coupon for it, and they are on sale 10 for $10. and my store triples up to $0.39, so my hand soap is FREE! What if my store doesn’t double or triple coupon? Even if your store doesn’t double or triple coupons, you can still get great deals and FREE deals. There are money saving apps that help you get cash back making items FREE often. Let’s say that butter is on sale for $1 at your store and you have a $0.75 off coupon for it and you pay $0.25 for it and then you see that one of the apps has a $0.50 off offer for the same butter, then you will get $0.50 back from the app making the butter FREE, PLUS you made $0.25 on the deal! Keep in mind that Walmart will also let you ad match and you can match sales ads of your local stores and do all of your shopping in one place AND Walmart will give you cash back on a product if your coupon is more than the cost of the product. Say that butter we keep talking about is $1.50 at Walmart and at a local store it’s on sale for $1 and you happen to have a $1.50 off coupon for that same butter. You can go to Walmart and get them to match the price of your store and then give them the coupon and they will hand you the butter and $0.50 to carry that butter out of the store! FREE PLUS paying you to take their food? Sounds great to me! There are deals like that EVERY week!. So, that’s about it! I know there is a lot of information here and some of it can become confusing so, if you have any questions or need clarification for anything you have read here, please feel free to contact me! I LOVE couponing and LOVE to teach and help people do it! I hope this helps you, let me know how much you are saving! should we have to use colored printouts or we can use black and white printouts of coupon. You can use either and they both will work fine. Where are you located, I live in Plant City, Florida. I’ve tried its hard where we live Conroe Texas . Can you explain how the doubling and tripling of the coupons work? I’ve wanted to coupon for years and I’ve looked over a ton of sites and I’m just not getting it I guess.. Your help is appreciated!!! Not many stores double or triple anymore – you’d need to find out first if your store does and if they have specific days they do or if it’s all of the time. Then if they do they will have a limit, in my area it is any coupon that says $0.39 and under the value is tripled at the register, and any coupon $0.40 – $0.50 is doubled at the register. So, a $0.35 coupon will become $1.05 at the register and a $0.40 will become $0.80 at the register and so on. Nothing you have to do, it’s all done at the register. Can I coupon If I don’t have a car? As long as you can get to the store.